Landscaping work is hard, but landscape software will help lighten your quoting and estimating load. 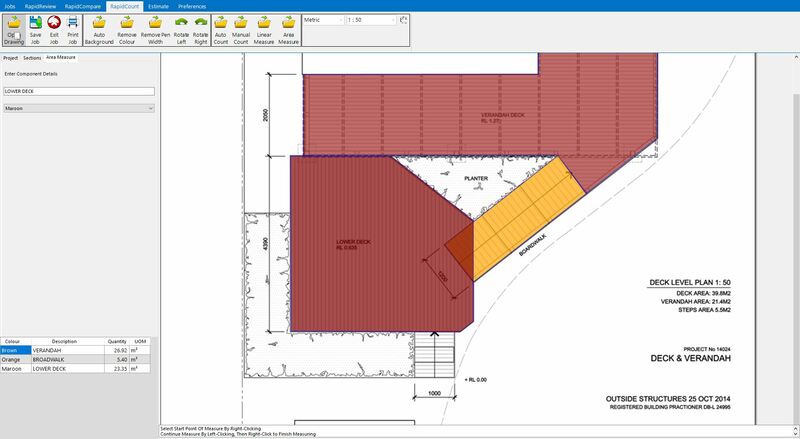 RapidQuote’s suite of estimating tools automate your scaling and counting processes, meaning you spend less time colouring plans and more time planning and crafting landscapes. So say goodbye to the rulers and the highlighters, cancel your standing order with the local printer and download a tool that’s been independently proven to save the average landscaping contractor four hours per quote. If you’d like to test that promise for yourself, click on the following link and we’ll walk you through using RapidQuote`s landscape takeoff software for your next landscaping estimate – you’ll soon see just how much time you could save. You can then start planning what you can do for your business with all those extra hours and extra money you’ll save – as shown by our savings calculator. RapidQuote is designed to make life easier for landscaping contractors by streamlining one of the most time-consuming and demanding parts of your job. Creating an accurate estimate. The methods landscapers currently use to take off quantities and estimate prices might work, but we’re willing to bet that they’re definitely taking longer than you’d like. In fact, an independent focus group claims that engineering, construction and landscaping companies think estimating and take-offs take at least 50% too long. There’s not a lot a software design company can do to make the physical part of your job easier. A computer program can’t spread gravel, plant shrubs, or plan an attractive garden or park. But it can count and measure. Our estimating tools are designed to give you more time to do the things a computer can’t do – managing your workforce, getting hands-on and taking an early finish. First of all, we removed the need to print full-size copies of your drawings. You’ll find it easy to review plans and add them to our tool’s folder, where the computer’s hard work begins. After removing background information with a single click, RapidQuote replaces rulers, pencils and highlighters with a handful of clicks. You identify one type of material you need to count, then our software finds the rest in half a second and gives you a total. 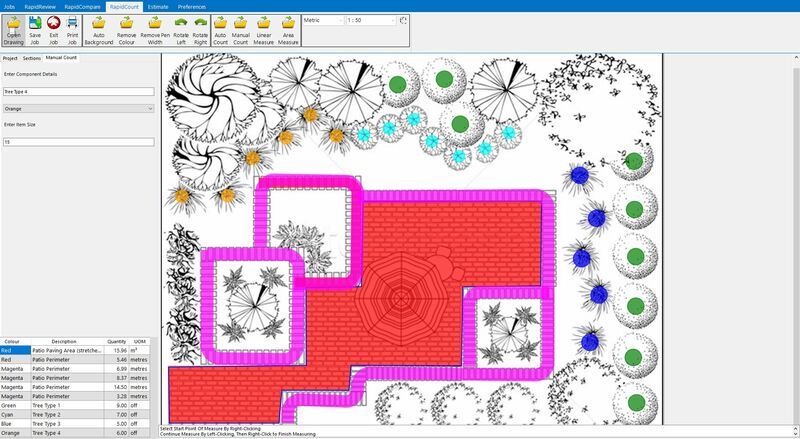 It doesn’t matter how complex the shape of your garden, patio or courtyard area is, RapidQuote can instantly measure and calculate areas for you. All those complex calculations about the area of an irregular patio? All taken care of. That’s hours of painstaking take off work completed in minutes. 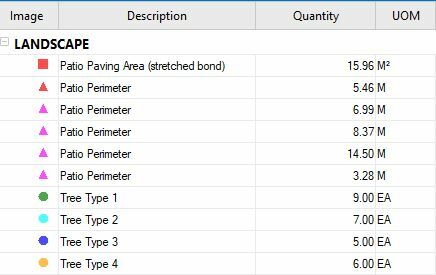 Once the take offs are done and you have your quantities (whether that’s turf, flagstones or any other landscaping materials), RapidQuote drops all of these quantities into a spreadsheet for you and handles the sums so that you don’t have to be an Excel wizard. All that’s left for you to do is watch as the spreadsheet calculates your final price. 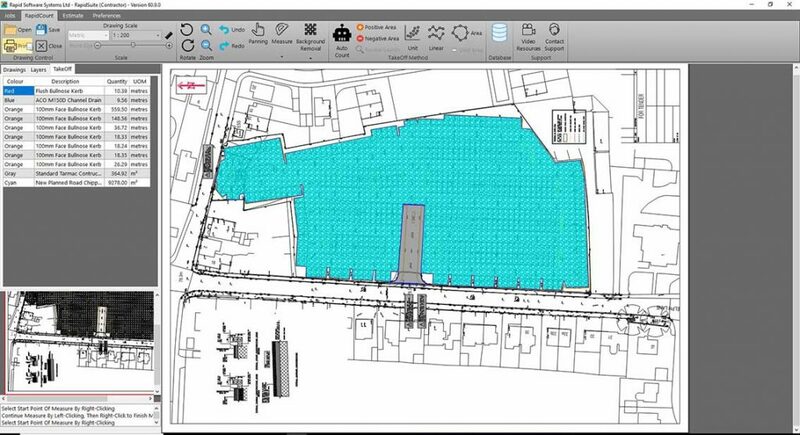 Our landscape estimating software produces even large, complex landscaping tenders in an hour instead of half a day, giving you more time to win more business, manage existing projects, or finish early for a hard-earned break. As the videos you’ve already watched show, our landscape estimating software gets the job done fast. But that’s no use if it takes you years to work out how to use it, where to click, how to work out which part of the plan is a tree, or what’s a wall. We don’t need you to be a computer expert. We’re software experts, and we’ve made this landscape tool so simple that we’re sure you’ll pick it up after a single guided demonstration from our team. And if you ever need a hand, we offer screen-to-screen walkthrough sessions where we show you how to get the most of RapidQuote. 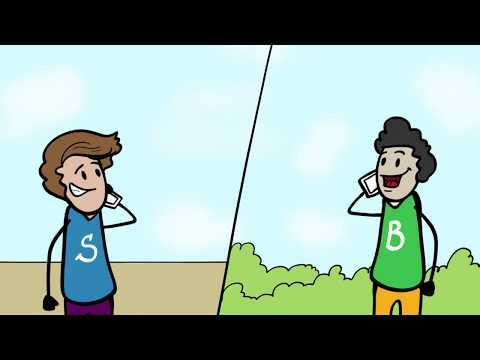 You can also ring telephone support in case you ever need to ask an expert. You’d be forgiven for wondering how many water features you’d need to install to pay for landscape software with this amount of functionality and support. So here’s the answer: not many. We’ve made RapidQuote as affordable as possible, and offer a range of packages depending on your needs and requirements. Our essentials package will set you back less than £1 per day over the course of a year, and includes all of the support and instruction you need to start saving time instantly. Even the most expensive package won’t cost more than £3 per day. Ask yourself – how much is your time worth? Is getting an extra four hours’ time per quote you send worth pennies per day? The contractors who’ve been using our software products for decades certainly think so, and they’d also tell you that we never sneakily raise our prices after you’ve been a customer for a while. 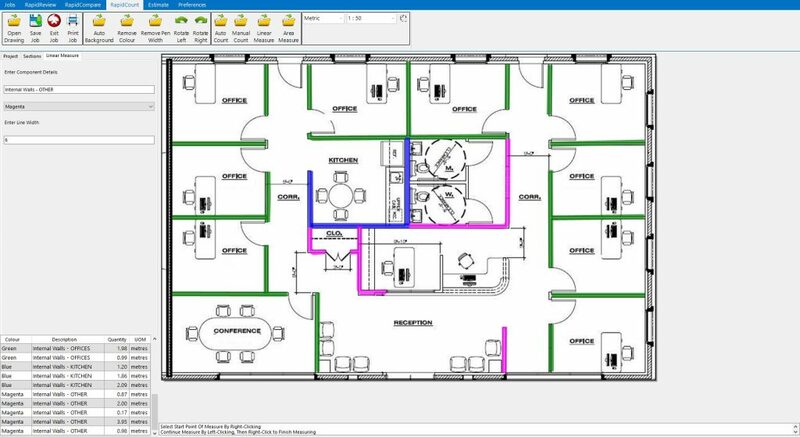 So if you’re aching to put down the pencil and get back on site, take RapidQuote for a spin today. RapidQuote estimating software is the result of decades of hard work and hard questions. Since 1980, we’ve asked builders, electricians, landscaping contractors and other trades what they need from our tools. Every suggestion we’ve had has been incorporated into one of our tools, and RapidQuote is designed to solve a very real problem? How real? Real enough that we had a professor at a Los Angeles university test it for us. His research told us that contractors aren’t just worried about finding subbies to work on projects, or suppliers increasing their prices, or pulling a back muscle shifting digging and carrying. He says you’re worried that you waste time on quotes, and that up to 75% of the estimates you’re spending five hours putting together don’t result in a landscaping job. 92% of contractors in the focus group managed to cut the time it takes to do a take off and estimate to around one hour. Down from five. Users were able to pitch for four times as much work using RapidQuote. And they were winning four times as many contracts, bringing more money in and growing their businesses. We’re not saying RapidQuote is scientifically proven to turn your landscaping business into a success. But the professor of business psychology at UCLA is, and we’re going to take his word for it. So stop wasting time on your tendering process. Leave the counting to the computer and get back to planting and managing. Click the link and we’ll guide you through using RapidQuote on your next genuine estimate. You’ll soon see how simple it is.